Hungry for a meal-time makeover? There’s a new menu of healthy, tasty, weight-loss friendly foods getting plenty of buzz. Andrea Holwegner, a Calgary-based registered dietitian and president of Health Stand Nutrition Consulting, helps us serve up the delicious scoop. It’s time to get the skinny on pizza. The thick crust variety loaded with excessive cheese is getting a makeover. “Thin crust pizzas are the trend versus the traditional thick, deep dish pizza,” says Holwegner. In addition to the thinner crusts, restaurants are covering their pizzas with stronger, more flavourful cheeses in smaller amounts – less cheese means fewer calories. 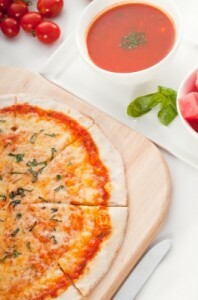 Chefs are also adding healthier toppings such as arugula to their pizzas giving diners more nutritious options. Move over flax and sunflower seeds. Chia and hemp are elbowing their way onto our plates. Nutritious and portable, seeds are a popular dietary staple – and for good reason. Chia and hemp seeds are naturally packed with fibre, protein, antioxidants and omega-3 fatty acids. A serving of chia seeds contains even more omega-3 fats than a single serving of salmon, good for reducing the risk of cardiovascular disease and lower cholesterol. If you’re feeling blue with the berry craze, here’s another super fruit clamouring for your attention. Cherries contain plenty of vitamin C, fibre and antioxidants. In fact, the red fruit rivals blueberries for antioxidant content. “Really bright coloured fruit tends to be loaded with antioxidants that protect us from cancer and heart disease,” says Holwegner. She suggests adding fresh or dried cherries to salads, baked goods, and smoothies. Bored with skim, or 2% milk? Not keen on soy, or rice milk? Try almond milk. “It’s a great substitute for a calcium-rich beverage to put on cereal,” says Holwegner. “Many people like the flavour.” Almond milk boasts calcium, vitamins D and E, plus it contains less sugar and fat than regular 2% milk. The downside? “There’s very little protein in it,” says Holwegner. “People think because it’s nut-based it should be, but almond milk isn’t huge on protein.” Still, almond milk is ideal for individuals with lactose intolerance, or dairy allergies. Restaurants are starting to take portion control seriously. Many establishments are embracing share plates – a tapas-style dining experience where people share different appetizers or small meals. “People can get their tastes met through sampling a variety of different things without the giant portion sizes of the past,” says Holwegner. Leading the charge – ethnic cuisine especially Asian, Indian and Spanish restaurants. A yummy side dish doesn’t have to be void of nutritional value. Chock full of iron, antioxidants, fibre and minerals, black rice is getting plenty of well-deserved buzz. This whole grain rice with its distinctive nutty flavour has numerous health benefits: decreased risk of heart disease, diabetes, Alzheimer’s and cancer. And for individuals watching their calorie intake, black rice – unlike white rice – will keep hunger pangs at bay. “You feel fuller because of the extra fibre,” says Holwegner. Our bodies digest high fibre slowly, so you won’t feel hungry, nor will you experience dramatic fluctuations in blood sugar.